Canadian composer Ana Sokolovic gives us a measured chamber music with a logical narrative quality that is most definitely contemporary yet has ties to classic modernism of last century in its harmonic edginess. We find her in great form with six recent works on the anthology Folklore Imaginaire (Naxos 8.573304). Ensemble Transmission handles adroitly and expressively the performance duties on this album, with six artists participating variously in the works as called for. The instrumentation varies from solo works--"Vez" (2005) for solo cello, "Mesh" (2004) for E-flat clarinet, "Trois Etudes" (1997/2013) for piano, "Un bouquet de brume" (1998/2013) for bass flute and piano, "Portrait parle" (2006) for violin, cello and piano and finally "Ciaccona" (2002/2011) for the sum total of instruments plus percussion. Each work speaks with a musical language of its own, rhythmically alive, periodically grouped into phrase "sentences," so to speak, and eloquently expressive, sometimes humorously so. There are extra-musical subtexts often enough. "Mesh" includes directions to the clarinetist the composer originally found with a hot-air hand dryer. "Portrait parle" gets its inspiration from a 1900 French police chart meant to aid in the identification of human subjects, the "Twelve synoptic tables of physiognomic traits." 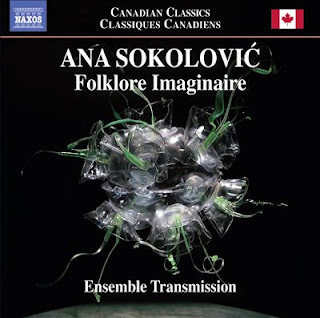 Whatever Ms. Sokolovic addresses in these works, many in first recordings, the music comes to us in memorably declamatory prosaic form, a highly aesthetic and elaborate kind of musical Morse code that signifies a self-referential content with a refreshing directness and originality. The music wears well and leaves you with a feeling of satisfaction that one has encountered significant modern contemporary music. I recommend this one and I myself look forward to more music from Ana Sokolovic.